Store cupboard puttanesca is a great fall back meal, one that’ll feed a family on those days when you really can’t be bothered going food shopping. It’s delicious, fiery and perfect when you want your food fast but still healthy. To make the puttanesca sauce put a saucepan over a low heat, tip in a tin of anchovies (the ones that come in olive oil) and gently cook whilst the anchovy fillets melt into the oil, throw in some chopped garlic, add a big pinch of chilli flakes, two tins of tomatoes, a handful of roughly chopped black olives and a couple of teaspoons of capers. Bring the sauce to the boil and then simmer with the lid off for around 15 minutes. Tip the anchovies and the oil they come in into a saucepan over a low heat and cook gently, stirring until the anchovy fillets have melted into the olive oil. Add the chopped garlic and a pinch of chilli flakes and cook for a few minutes. Tip in the chopped tomatoes, black olives and capers and bring the puttanesca sauce to the boil, reduce the heat and simmer with the lid off for around 15 minutes whilst you cook the spaghetti. 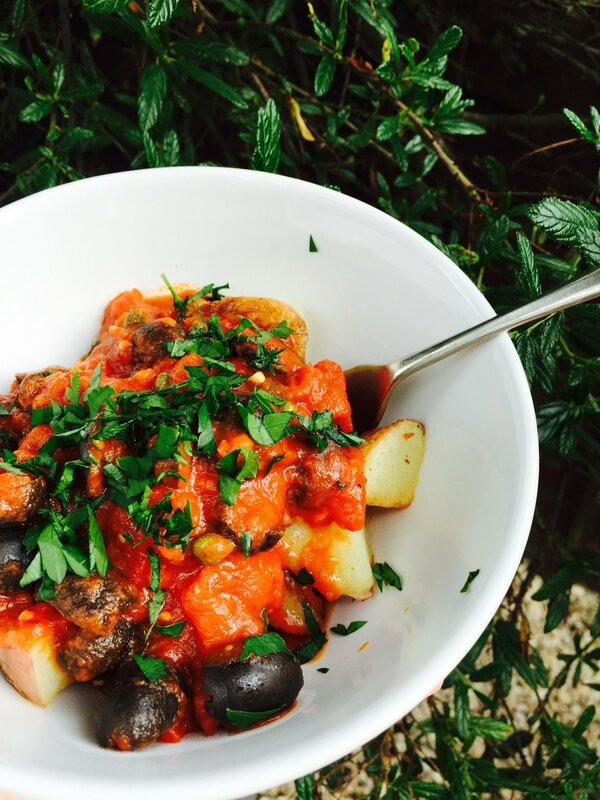 You can serve this stirred into spaghetti, turned into a patatas bravas style dish for a gluten free version (pictured above) or just spoon into dishes and serve with crusty Italian bread to mop it up with. Like your pasta baked – then stir into penne, top with mozzarella and parmesan and bake in a hot oven to brown. Get the patatas bravas recipe here and just substitute the puttanesca sauce.